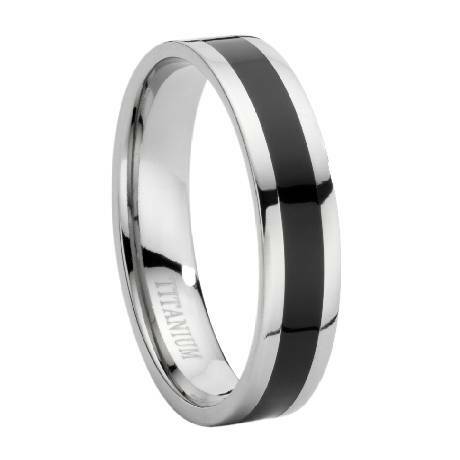 Sleek and sophisticated, this black titanium ring has a dressy appearance that looks great on any man! The 6 mm flat profile band is made from polished titanium, with a contrasting black enamel inset encircling the center. For men who like a contemporary look, this ring makes a fashion statement without being too bold. A Comfort-fit design means the inside edges of the ring are rounded off for an effortless fit. I received my order very quickly. The ring I purchased is absolutely beautiful! I do recommend that you have your ring finger sized at a store before purchasing. Mine ring is about 1 1/2 sizes to big by doing the "strip of paper" method. Overall,I'm giving MWR a 5 star. Very fast delivery, great customer service. It is my fault I ordered the wrong size. I'll have to exchange it soon. Excellent quality comfortable ring. And really helpful friendly customer service would highly recommend. He LOVED this ring. Very comfortable. Size was spot on. Perfect price pint and very sharp looking on the finger. I will definitely recommend this site to other people. Fast service and I got exactly what was represented in the picture and description. Thank you.